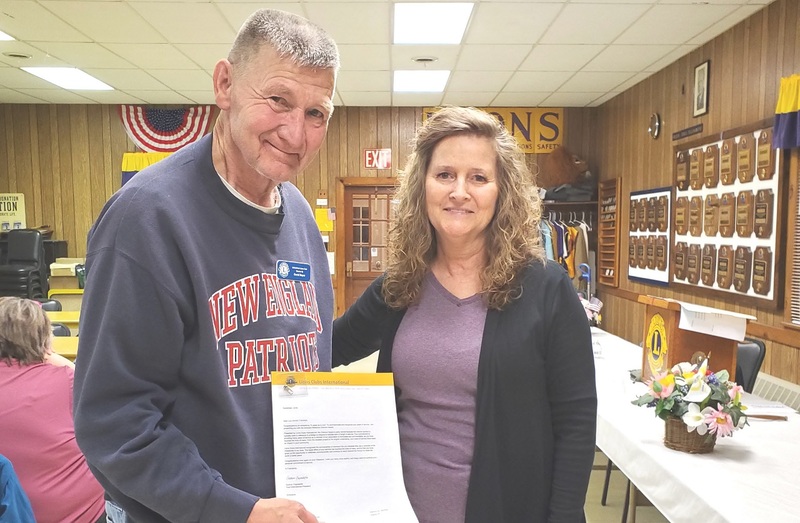 Whitefield Lion David Roper was presented with a Chevron award on March 28 at the Whitefield Lions Club, in Coopers Mills. Roper, of Whitefield, received the award for 15 years service with the club. Presenting the award is club President Kim Haskell. 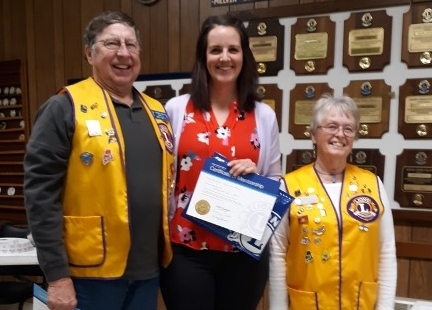 Michelle Boyer, of Augusta, was inducted into the Whitefield Lions Club on March 14 at the regular meeting held at the Lions Den, in Coopers Mills. The induction ceremony was performed by First Vice President, Lion Donna Brooks, of Jefferson. Boyer is sponsored by Lion Barry Tibbetts, of Whitefield. 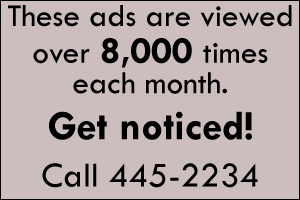 To learn more about the Whitefield Lions Club call Whitefield Lions Club President, Kim Haskell at 446-2545. Seventy-three years ago, two local men took part in some of the most intense conflicts of World War II that took place within months of each other and brought U.S. troops closer to mainland Japan. 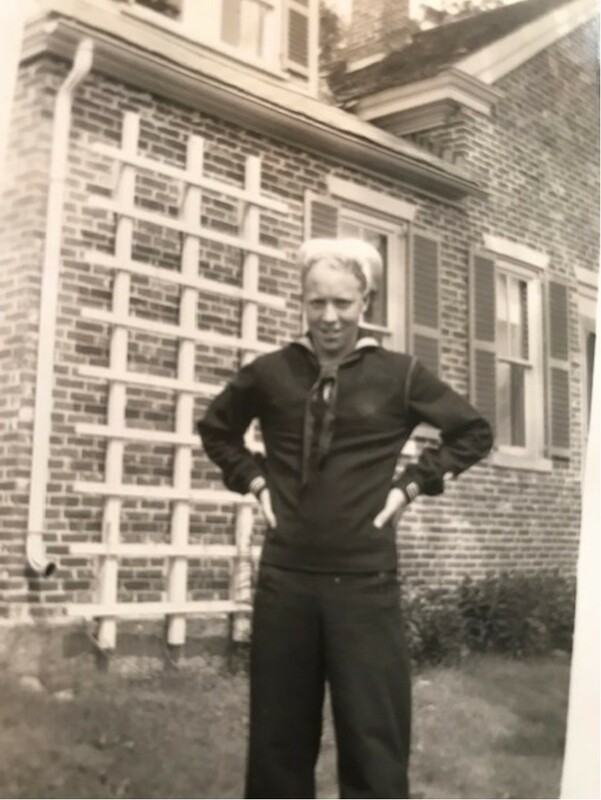 Albert R. Boynton, from Whitefield, was only 17 years old at the time and had enlisted in the Navy with his father’s permission. He turned 18 by the time he arrived at boot camp at Sampson, New York. After training, Boynton was assigned to the USS Goodhue APA-107. Their mission was to transport Marines, armaments, equipment and food and medical supplies to strategically located islands. 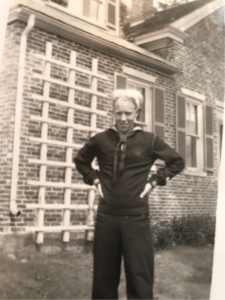 Carl J. Stenholm, of China, also a new naval recruit of 18 years of age, was assigned to the USS Hyman DD-732, a destroyer newly tooled from Bath Iron Works, in Maine. Their mission was to protect the transport vessels, destroy enemy aircraft and provide the gunfire to protect the Marines as they landed on the beaches. By early February 1945, hundreds of ships were gathered from the Atlantic and Pacific theaters for long-range battle plans to strategically take over islands close to Mainland Japan. The Hyman and Goodhue were assigned to this complex offensive. On D-Day February 19, 1945, the naval invasion surrounded the island of Iwo Jima. The USS Hyman was positioned close to shore, so close that Marines could be seen moving forward on land with flame-throwers. There would be no more practice drills for the 370-member crew on the Hyman. Standing dead in the water, their guns bombarded the shores clearing the way for the Marines fighting yard by yard on rough, unsheltered terrain. By February 22, all but the western side of Iwo Jima had been silenced and the Marines were anxious to take Mount Suribachi that night. The Hyman was volunteered to provide the searchlight illumination for the Marine’s climb, knowing it would make their vessel an easy target. A close call by an enemy shell reminded the crew this was a night they would not forget. Through the dark, The Hyman’s 5-inch and 40-caliber guns were carefully coordinated over ship-to-shore radio to provide accurate coverage for the Marines. At 0700, February 23, the Hyman was ordered to hold fire and the Marines would take the remainder of the hill by small armaments. Stenholm and his crew-mates didn’t realize at the time they would be witnessing history. Three hours after the Hyman was ordered to cease fire, the sounds from Marines’ gunfire and grenades on top of the hill also went silent. At 1020, a flag was raised by a small band of Marines indicating that Suribachi was ours. This event was the iconic flag raising of Iwo Jima. On March 26, 1926, closer to Mainland Japan, the USS Goodhue arrived at Keramo Retto to put ashore troops and equipment for the upcoming invasion of Okinawa. Unfortunately, while returning to sea, the Goodhue underwent heavy air attack on the evening of April 2. The two anti-aircraft guns successfully defended the vessel from Kamikaze attack from the starboard. They were not as lucky with the attack heading dead ahead. The enemy aircraft hit the mast killing crew in the stern as it fell. Exploding bombs from the plane caused further casualties and fire aboard the vessel. Boynton remembers hearing an announcement from the PA system, “Damage Control report to Shaft Alley,” and he knew they would be checking for leaks. He said he was very worried “he’d be going for a swim” and checked his life saving gear. Worrying would have to wait for later. Boynton was immediately sent to stretcher duty. The attack killed 27 and wounded 117. A makeshift morgue was set up in a hallway, an unsettling sight for young men’s first experience of death. Boynton vividly remembers taking a moment that night with his good friend Harry Hawkins, from Missouri, to pray. In the morning, they anchored into a calm bay with other damaged vessels. Following repairs, the Goodhue rejoined her squadron on April 10 to resume her transport duties at Okinawa. The battles of Iwo Jima and Okinawa saw heavy casualties on both sides and were victories for the U.S. forces leading to the end of the war. 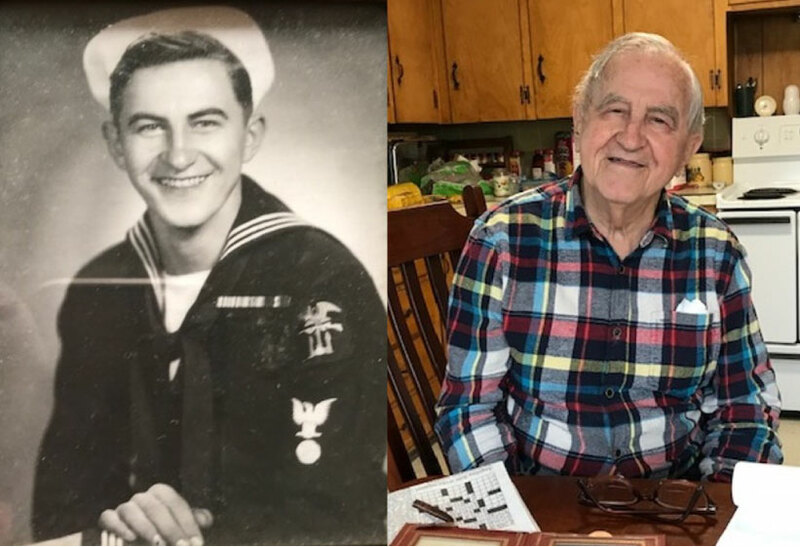 Both men came home safe, yet still mourn the shipmates they lost along the journey. The memories and emotions of war run deep even after 73 years. This Veterans Day, as you thank men and women for their service, take a moment to ask them to share their stories. 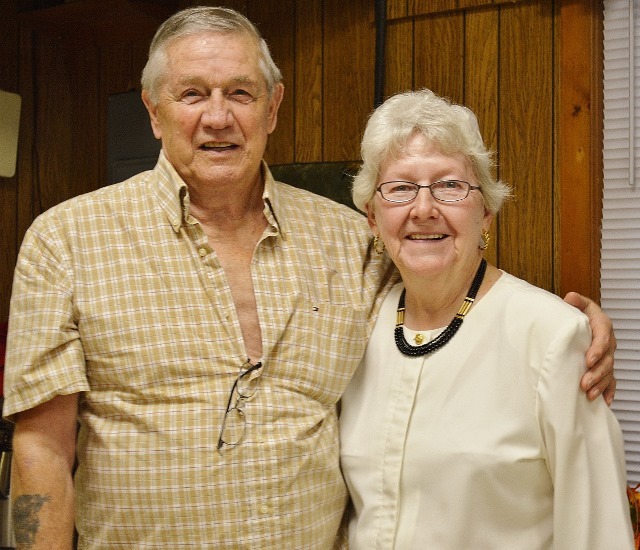 Peter Taylor, from the town of Washington, has attended St. Denis Church, in Whitefield, for 40 years, and for him, there is no place like it. Al Parker, who has attended the church for more than a quarter century feels similarly. He said he used to travel around the country and the world for his work, but none of the churches he found compared to St. Denis. “St. Denis is very, very unique. The people there are unbelievable. 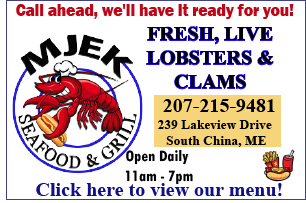 The community that we have is second to none,” he said. Taylor and Parker were among the many parishioners who filled St. Denis Church on Sunday, June 10, to commemorate the church’s 200th anniversary. Bishop Robert Deeley celebrated the anniversary Mass (20 pictures below). “The records of history show that there was only a small Catholic community here in Whitefield when Bishop Cheverus, then Bishop of Boston, of which Maine was a part, visited in 1812. There were perhaps five Catholics. Five years later, however, the reality was quite different. The rich farmland of the Sheepscot River Valley, available for a reasonable price, had drawn many Irish immigrants who had come to America seeking a new way of life, just as immigrants do today,” the bishop recounted in his homily. St. Denis Church, originally spelled with two “n’s”, is the second oldest Catholic church in New England, predated only by St. Patrick Church in Newcastle. 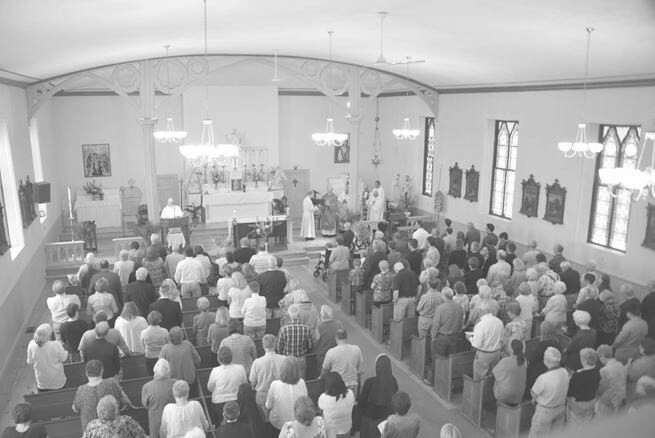 The church got its start when Father Dennis Ryan, who had been assigned pastor of St. Patrick by Bishop Jean-Louis Lefebvre de Cheverus in 1818, recognized the growing population in Whitefield and chose to move there. Work on the first church began that same year, and it was consecrated by Bishop Cheverus in 1822. The original church was a white, wood-framed building with no pews. People would stand or kneel on the floor. “The first settlers knew they needed their faith, and their faith was not their own. It needed a community and a place to celebrate Mass. They knew the meaning they derived from the love of God they experienced in their relationship with Jesus. They wanted to nurture that for themselves in the harshness of winter in a new place, and they wanted to hand it on to their children. It is the legacy they passed on to you. You and I are now the brothers and sisters of Jesus in this place,” the bishop said. The church community continued to thrive, and in the 1830s, the Irish Catholic population of the parish had grown to nearly 1,200. Unfortunately, the church also wasn’t well maintained, which caught the attention of Bishop Benedict Fenwick, the second Bishop of Boston, who visited in 1832. He urged the community to build another church, and the following year, work on the current church began. The new church was consecrated by Bishop Fenwick in 1838. At the time, it was Maine’s largest Catholic church building, as well as having the largest congregation. The church was designed like a typical New England meetinghouse, an appearance it retains today. Among the changes along the way, however, was a new Italianate-style tower, which replaced the old belfry in 1862. Around 1890, stained-glass windows were added, the sanctuary was enlarged, and decorative work was added to the walls and ceiling. In 1976, it was entered on the National Register of Historic Places. The church underwent a major restoration beginning in 1997. “It’s quite a quaint building, very nostalgic, old, but very comforting. It’s a very nice place to worship,” said Parker. St. Denis Church is now part of St. Michael Parish in Augusta, but it has maintained its rural character, as well as its loyal congregation. “My mother, she brought us up here, and I still live in this area. It’s just very special,” said Louise Reed, Caswell’s sister. “It’s very nice. Wonderful, wonderful people,” said Anne Springer, age 102. The church was full for the Mass, as was the parish hall for a celebratory brunch. Among those in attendance were several Sisters of Mercy. From 1871 to 1888, the Sisters of Mercy ran an orphanage at a convent across the street from the church and also taught schoolchildren. Several sisters are buried in the church’s historic cemetery. Concelebrating the Mass with the bishop was Father Morin; Monsignor J. Joseph Ford, a native son of the parish; Father Ralph Boisvert, who formerly served there; and Father Roger Chabot. Father Arokiasamy Santhiyagu, HGN, a parochial vicar of St. Michael Parish, joined the gathering for the reception. As the St. Denis community celebrates its 200th anniversary, the bishop stressed the importance of continuing to gather for the celebration of the Eucharist, which is why the church was first built. “As we begin the third century of Catholic life in this valley, it is a good opportunity to ask God for the grace we need to be faithful to Jesus’ invitation to be part of his family, ‘whoever does the will of God is my brother and sister and mother.’ If we do that together as Church, the Lord will be with us, and we will bring the light of Jesus’ message into our world,” the bishop said. Lincoln Academy student Emma Allen, daughter of Cynthia and Andrew Allen, of Jefferson, was awarded a $1,000 scholarship. Emma will attend St. Joseph’s College and pursue a degree in physical therapy. Lincoln Academy student Madison Allen, son of Cynthia and Andrew Allen, of Jefferson, was awarded a $1,000 scholarship. Madison is pursuing a career in aviation and will attend the University of North Dakota in the fall. Lincoln Academy student Basel White, son of Erica and Daniel White, of Jefferson, was awarded a $1,000 scholarship. Basel is attending University of Maine, Orono and will major in biomedical engineering. Erskine Academy student Morgan Emond, daughter of Mindy and Gary Emond, of Windsor, was awarded a $500 scholarship. Morgan will attend the University of Connecticut. Erskine Academy student Samantha Jackson is the daughter of Dan and Katrina Jackson, of Whitefield. Samantha was awarded a $500 scholarship and will attend University of Southern Maine. 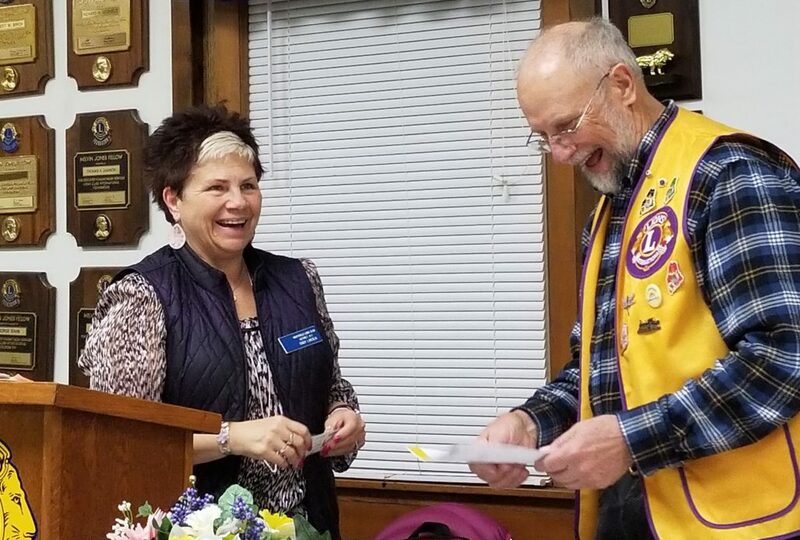 At the January 25 meeting of the Whitefield Lions, club president Cindy Lincoln was presented with the Membership Key Award and the Silver Centennial Award for Membership. Both awards are given for inviting and sponsoring new members into the club. 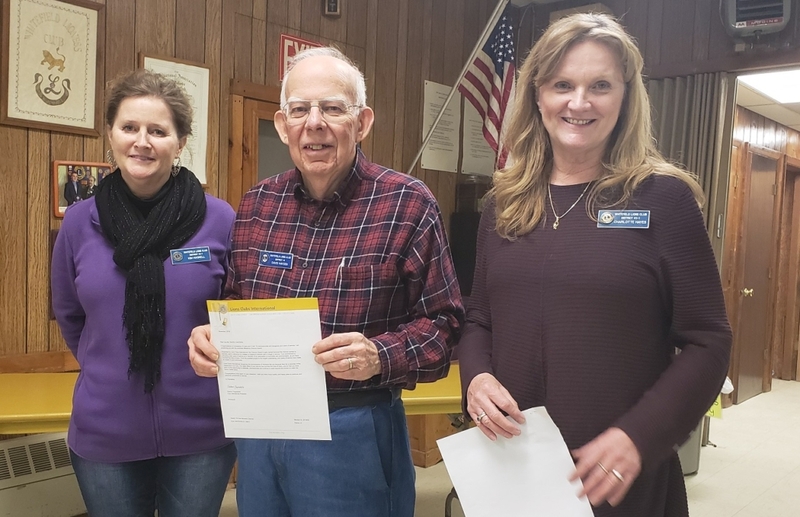 At the January 28 Cabinet meeting, Lion Cindy Lincoln accepted the 1016-2017 Excellence Award on behalf of the Whitefield Lions club. 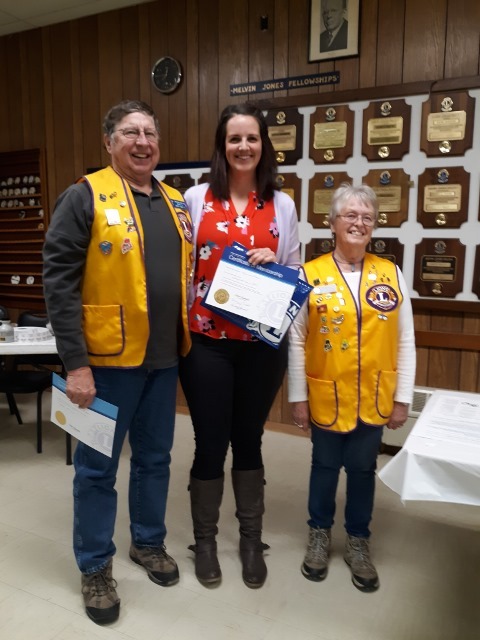 Lincoln, has served as president of the Whitefield Lions club for two of her nine years in the club. 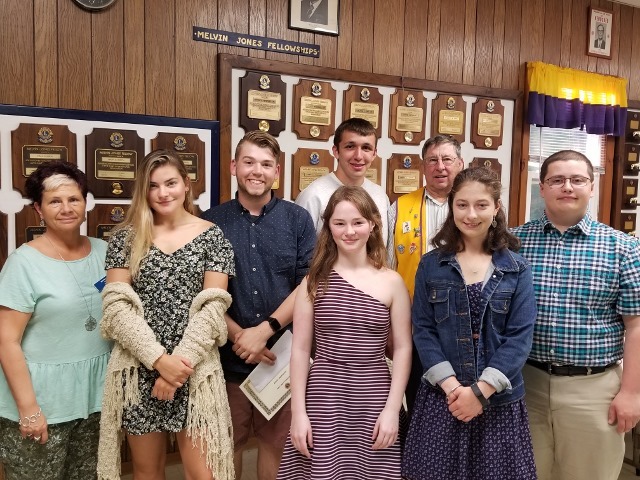 The Whitefield Lions Club was one of 15 clubs in the state to receive the award. Whitefield Lions Joe and Carolyn Greenwood, of Windsor, celebrated their 26th wedding anniversary on December 14, 2017. 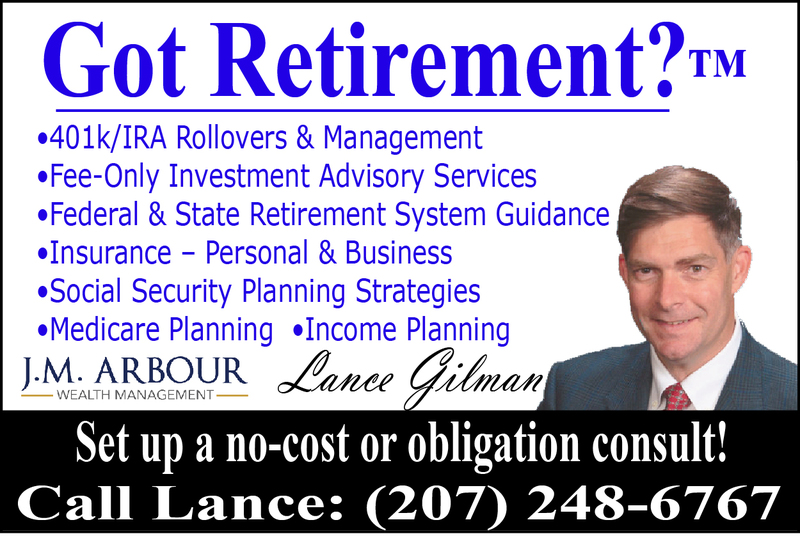 The Greenwoods have been active members in the club for 12 years since moving to Maine from Amesbury, Massachusetts. 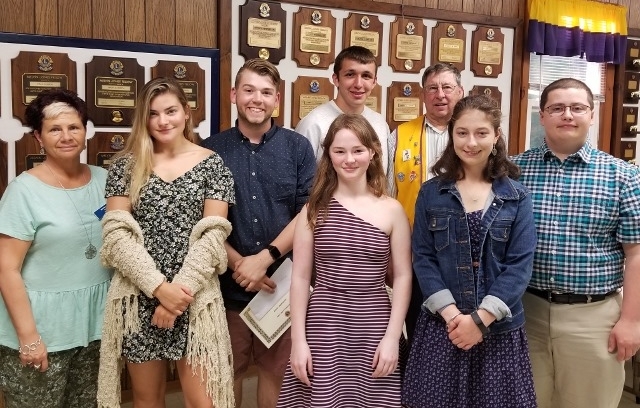 From left to right, Carolyn Greenwood, Caitlin Labbe, Dagan Savage, Lydia Gilman, Santa, Courtney Paine, Alana York, Olivia Kunesh, Alex Mahon, Harrison Mosher, Brenda Bonsant and Noah Bonsant. 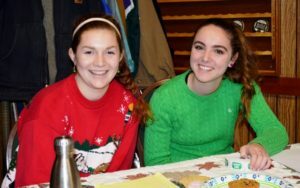 Whitefield Lions club hosted their annual Christmas for Kids party Sunday, December 10. A lunch of hot dogs, chips, and punch was served, followed by cookies and ice cream. Santa stopped by for a visit and kids clamored to tell him what they want for Christmas. Requests ranged from Lego sets to a puppy. Games were played and songs were sung and children were awarded raffle prizes, including cans of popcorn, stuffed beanie babies, candy, porcelain dolls, a scooter and a bicycle. Eight members of the Erskine Academy Leo club were on hand to help the Lions greet guests, serve food, and hand out gifts. Twenty-five local children and their families attended the event.